Reading Dutch acts is a skill that you can learn, even if you don't speak Dutch. The form of Dutch acts from the civil register is relatively constant. With practice, patience, perseverance, and a good dictionary, you can understand most acts, even though you won't be able to understand every word. Other sources, such as church books and the population register, are mere lists of names, dates and places - with just a few Dutch words, you can understand what it is all about. The aim of this dictionary is to help you understand Dutch acts. All words and phrases listed below are taken from major Dutch genealogy resources, such as civil register acts, population registers and church books. Many of these phrases are archaic - this list is not meant to help you with conversational Dutch! 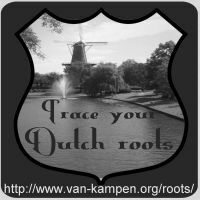 For more information on the main sources for Dutch genealogy research, see my article Sources for Dutch genealogy research. Half Half. When followed by a number, half an hour before the hour: Half twaalf (litt. half twelve) is half past eleven.